The soldiers who served under General Robert E Lee early in the American Civil War jokingly called him "Granny Lee" for what they perceived to be his timid command style. They would soon learn to respect this aggressive military commander. Below you will find a list of interesting facts about this great Confederate general some of which every kid who as ever read a history book will know and some facts which you may never have learned. Click here for a great selection of Amazon.com books about General Robert E Lee. Robert Edward Lee was born on January 19th 1807 in Stratford Virginia. He married Mary Custis who was the great-granddaughter of George and Martha Washington. They had 7 children together. Lee died on October 12th 1870 after suffering from a stroke. Robert E Lee's father, Henry Lee (Light-Horse Harry), was a Revolutionary War hero. He was a colonel in the Continental Army and won praise from George Washington. In 1825, at the age of 18, Lee entered the West Point Military Academy. He was one of the best cadets ever to attend the academy. He received high marks in all his studies and graduated without a single demerit. In the Mexican-American War (1846 - 1848) Lee served under General Winfield Scott. Here he first displayed the skills as a commander that he would later use as a general in the American Civil War. 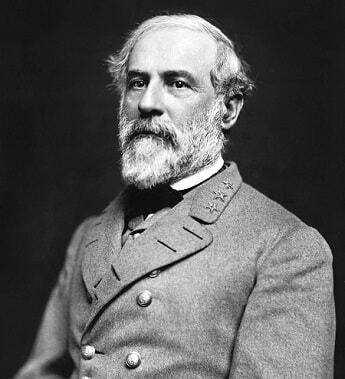 In 1852 Robert E Lee was appointed Superintendent of the West Point Military Academy from which he had graduated. In 1861 Union forces seized Lee's family home and made it into Arlington National Cemetery. Lee's house still stands in the middle of the cemetery. After his loss at the Battle of Gettysburg Lee sent the Confederate president, Jefferson Davis, a letter of resignation. Davis promptly refused it. After the American Civil War in 1865 he accepted a position as president of Washington College in Lexington, Virginia. He served as president of the college until his death in 1870. At the outbreak of the American Civil War, in 1861, Abraham Lincoln actually offered Robert E Lee command of the Union Army. Lee was not willing to fight against his home state of Virginia, which had seceded from the union, and did not accept Lincoln's offer. Instead he joined the Confederate forces. Early in 1862 Lee became a personal military advisor of the Confederate President; Jefferson Davis. In May of 1862 Lee took command of the Army of Northern Virginia. He got this opportunity to lead the largest Confederate army when General Joseph E. Johnson was injured in the Battle of the Seven Pines. In June and July of 1862 Lee halted a Union drive towards the Confederate capital of Richmond Virginia. His success in the so called Seven Days Battle earns him the respect and confidence of many southerners. In August of 1862, under Lee's command, the Union army wins the second battle of Bull Run in Virginia. On September 17, 1862 he engages the Union army at the Battle of Antietam. This battle goes down in history as the bloodiest single day of the Civil War with both sides suffering great casualties. In December of 1862 Lee leads the Confederate army to a decisive victory at the Battle of Fredericksburg. In what may considered his greatest victory of the Civil War Lee defeats the Union Army at the Battle of Chancellorsville in May of 1863. From July 1st through July 3rd 1863 Lee's Confederate forces repeatedly attack Union forces led by Union General George G. Meade in the biggest battle of the Civil War; the Battle of Gettysburg. Lee is defeated and forced to retreat. Most historians regard this defeat as the turning point of the war. By April of 1865 the Union Army had captured the Confederate capital of Richmond Virginia and the important city of Petersburg Virginia. Lee had no choice but to surrender to General Union Ulysses S. Grant; which he did on April 9th of 1865 in Appomattox Virginia.